just hours after not watching the gold-winning canadian olympic men's hockey game, (and 2 days after not watching the canadian women's), i am making these veggies (to follow) and dictating my blog post to myself in my head, not in english. which gets me thinking; could this be it? could this be the end of my grabbing to some scraps of what held me so close to my home and native land, and the beginning of me completely letting go and becoming, gulp, a bona fide ex-pat? there's a sense of loss in redefining one's identity that i am not sure i am ready for... am i? writing this blog post in english = 36 minutes, writing this blog post in hebrew = 32,983,465,875 minutes. what a relief that i didn't forget my english yet. so, let me be your liason. this is my mother tongue and i got some great stuff to tell you. B) sunglasses smiley. yesterday i was out with his royal chefness at a very mediocre restaurant and we ordered a baked cauliflower, the level of cooking which he so cleverly described as, "צליה פחדנית" or in as best as i can translate "cowardly broiled". yes, the pale cauliflower was cooked (in boiling water) to tenderness, but the not-even tan it got from the few seconds it spent in the oven afterward, resulted in the edible equivelant of a yawn. people! respect the vegetable. it's not that hard. i will show you. 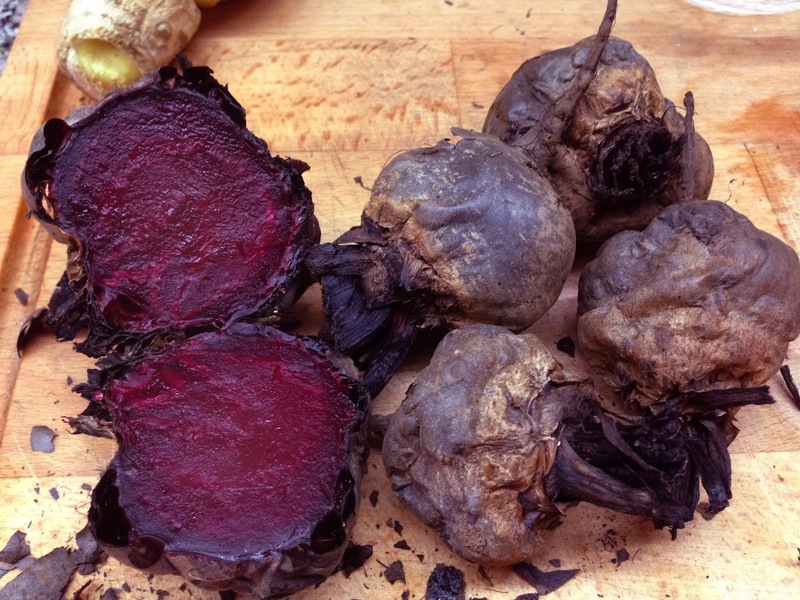 these are just your average, small red beets. nothing fancy. they are not peeled, they are not boiled, they are not smothered in oil or anything. (they ARE washed). just as they are, throw them right into the bottom of the oven. let them sit there, untouched for 2-2.5 hours at the hottest heat. burn the hell out of them. 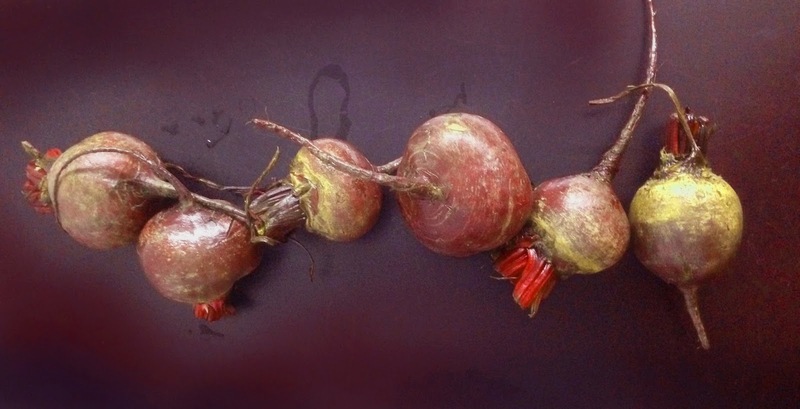 when you touch them with a fork, the skin should no longer be sitting snugly on, it should be crisp and crackly, and your fork should have an easy time digging into the beet. if you are unsure, err on the side of burning. don't be cowardly. the skin, char. the inside, perfect, deep ruby jeweled sweetness with a kick of burnt. you can do anything! because this is a vegetable maximized to its full potential, and it tastes great! what else should you burn? -cauliflower, which has to be cooked to softness in boiling water before, but which is no less worthy of a proper browning/charring. -like i said, don't be scurred. it's always better a little over than a little under. -leave all the peels on! they're nature's tin foil. -use an electric oven, bonfire, wood-oven, barbeque, whatever. lots of places to find contained heat/fire. -when you're unsure if it's done or not, give it a poke. if it seems ready, take one out and test it to see. trust me, courage, my love.